Made from durable, natural-looking Glass Fiber Reinforced Concrete (GFRC), AdventureScapes components combine the ruggedness of the Landscape Structures' Natural Climbers with the exciting challenges of CorocordÂ® climbing cables. Playground planners who are looking to maximize play value can choose from nine different AdventureScapes configurations, involving two, three or four Natural Climbers, each one linked to the next by a matrix of durable climbing cables. Kids can climb all afternoon and never touch the ground! RockCraft Designs offers concrete playground climbing boulders, which feature a full range of natural climbing holds of various sizes to provide fun and adventure for climbers of all ages and abilities. 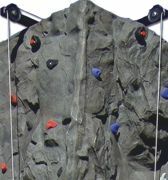 The multitude of holds allows climbers to fully traverse the boulder both vertically and horizontally. Each hold has been meticulously formed to enhance both the safety and authenticity of the climbing experience. The RockCraft Designs team provides the most realistic finishes in the industry, including West Coast Granite, Selkirk Quartzite and Desert Sandstone. Each piece comes with a 15-year warranty. Spectrum has climbing solutions for every application. Their legendary Auto Belay provides safety on climbing walls up to 75 feet high. It's easy to install and service, and is the perfect replacement solution for obsolete MSA Redpoint Descendersâ€”ask about the MSA discount. The Auto Belay is manufactured to strict ASTM F-24 standards, resulting in a safety device that has never experienced a design-related failure in 16 years of operation. Spectrum also manufactures portable climbing walls in every size for outdoor use. Modular panels are available for indoor gym installations. And new playground boulders provide options for every budget. PlayworldÂ® Systems Inc. brings the fun of outdoor play inside with its indoor climbing walls, making climbing fun for all ages. Unlike other playground equipment, climbing walls provide a strictly angled horizontal obstacle, challenging children both physically and mentally using muscle strength, balance and problem-solving skills. Handheld grips come in three sizes and can be adjusted in four positions to increase or decrease the wall's difficulty for climbers of all ages and experiences. For all educational purchases made, Playworld Systems will provide a lesson plan for teachers to maximize the indoor climbing walls to the fullest. Freshpark's "Park in a Box" is the first portable, foldable, weatherproof skatepark that comes in its own 20-foot storage container. All of the ramps, rails, boxes and grinds arrive pre-assembled, along with 24 helmets, pad sets, complete boards, canopy and everything else you need for a professional-style skateboard programâ€”large enough to fit in a basketball court. Includes six professionally designed layouts that set up in minutes, and easily fold back up into the supplied 20-foot storage container to be locked up for another day. Great for bikes, scooters and inline skates, also. American Ramp Company is the world's largest skatepark provider, specializing in above-ground, in-ground and hybrid design-build operations. Skater-owned and-operated, ARC's continued commitment to innovative skatepark design and construction can be experienced in over 1,000 communities in 20 countries. 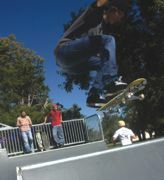 ARC remains the only skatepark company in the industry offering every available method of skatepark construction. From concrete to steel to composite, they will share the pros and cons of each build method and help you decide which construction type and skatepark layout will best meet your community's wants, needs and budget. Sport Resource Group's ProWallÂ® Rink System is the perfect solution for recreation programs that are trying to fit more and more sports into less space. Made in modular sections, users such as recreation departments, colleges and universities, military bases and more can section off parts of a gym or existing field to adapt that space for sports such as gaga, soccer, floor hockey and more. All panels are 42 inches high and are interchangeable, so each section connects to any other section. Add upper containment such as netting or acrylic. Panels can be 100 percent portable, semi-permanent or completely permanent. Park Pets & Boulders has a realistic, strong and lightweight series of boulders for playgrounds and parks, or residential landscapes as an architectural feature. Built with a realistic, rock-like finish, these lightweight boulders have a highly detailed exterior surface that captures the minute details of real boulders. Boulders are prefabricated at Park Pets' facility in California and shipped in one piece, ready for an easy installation.